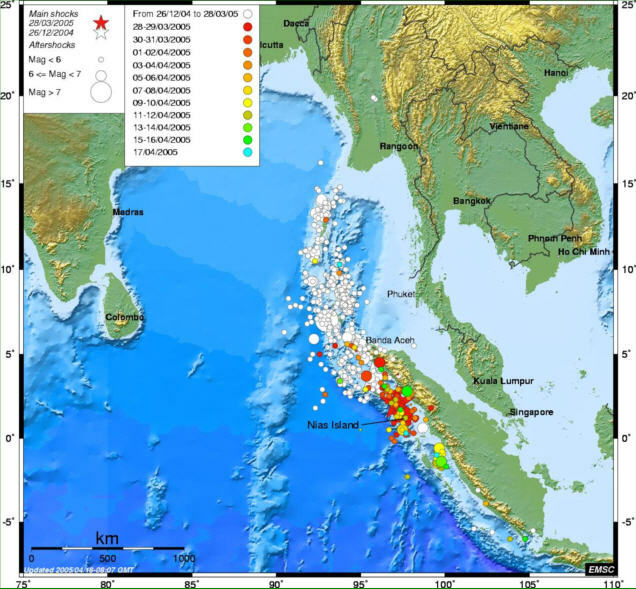 The earthquake of 9.3 Richter magnitude at the northwest of Sumatra on 26th December 2004 triggering the giant tsunami that devastated the lives and properties of people in Thailand and around the Indian ocean. The tsunami has been a major disaster - not only of Thailand but the world history. DMR was one of the several organizations that proposed to the policy level contribution to the post disaster work, both immediate and long terms. DMR by help of CCOP T/S and Cooperating Countries organized within about one month, the international seminar on Tsunami : "How Thailand and the Neighboring Countries will become ready for the Tsunami?� on 31st January 2005 � 1st February 2005 in Bangkok. The event was well responded by a large number of attendants of nearly 700. A total of 61 agencies were represented, of which 25 were from Thailand and 36 from other countries. Moreover, various geoscience works of the post-disaster immediate response were carried out in the tsunami affected areas. The 26th December 2004 tsunami, was really a major influence to the government to improve the disaster warning system in the country. The National Disaster Warning Center (NDWC) was set up in 2005 to be responsible for all kinds of both natural and man-made disaster warnings. At present, the NDWC works closely with the Department of Meteorology (TMD) and the Department of Mineral Resources (DMR) with cooperation of the domestic radio, television stations and communication agencies. At present stage, NDWC�s activities covers only the tsunami and earthquake warning/monitoring but will however be expanded to cover all kinds of disaster in the near future. Latest, the NDWC under a cooperating with the National Ocean and Atmospheric Administration (NOAA), U.S.A., has launched a DART (Deep-ocean Assessment and Reporting of Tsunamis) buoy in the Andaman Sea, off the west coast of Thailand on 3rd December 2006 to monitor the tsunami in the Indian Ocean.